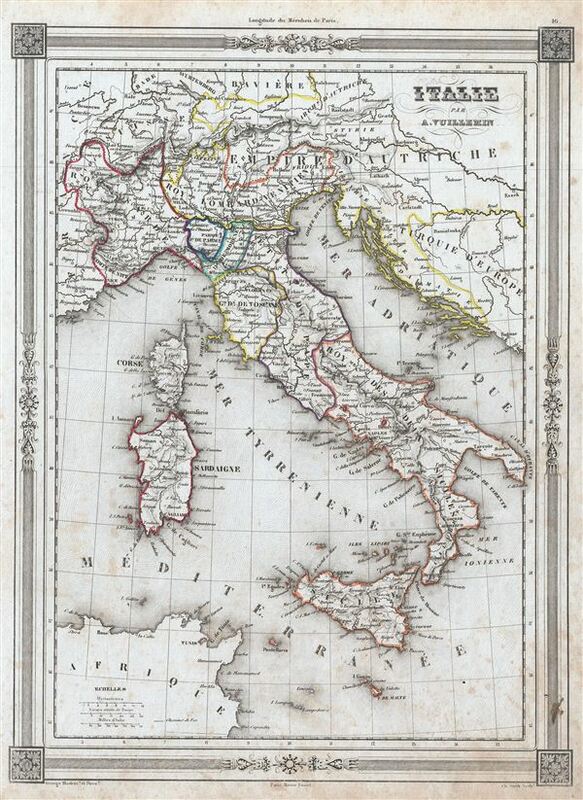 An uncommon and extremely attractive 1852 map of Italy by A. Vuillemin. Covers the pre-Garibaldi Italy split into numerous small duchies and states from Venetian Lombardy south to Sicily and Malta. Also includes the islands of Sardinia and Corsica. Throughout, the map identifies various cities, towns, rivers and assortment of additional topographical details. At this time in history, the peninsula was undergoing the Risorgimento, Italy's march toward national solidarity. Following the defeat of Napoleon and the merging of Sicily and Naples into the Two Sicilies, the Island of Sicily witnessed revolts against the Bourbon rule in 1820 and 1848. The final revolution in 1848 resulted in the island gaining independence from Bourbon control for 16 months. The map features a beautiful frame style border. Prepared by A. Vuillemin for publication as plate no. 16 in the 1852 edition Maison Basset of Atlas Illustre Destine a l'enseignement de la Geographie elementaire.